S&P cited Illinois lawmakers’ failure to pass a budget and the lengthy budget impasse as reasons for its one-notch credit downgrade. Over the years, Illinois’ state credit rating has been downgraded multiple times due to massive spending and excessive borrowing. The credit rating agency S&P Global Ratings has downgraded the state of Illinois’ credit rating to BBB-, just one notch above a noninvestment-grade, or “junk,” rating. S&P has also placed the state rating on “negative” watch, meaning the agency could downgrade Illinois again in the near future. This downgrade came June 1, the day after the Illinois General Assembly’s spring legislative session ended. The rating agency acted because the General Assembly failed to pass a budget for fiscal year 2018, which begins July 1. Moody’s Investors Service also downgraded the state on June 1. The passage of a budget prior to July 1 is now more difficult, as any budget vote requires a three-fifths majority rather than the simple majority required during regular session. S&P warned that Illinois is in danger of entering “a negative credit spiral.” That means that the lower credit rating will make it more expensive for Illinois to borrow money, and thus even harder for the state to pay its bills. This in turn could result in an even lower rating. While the agency is correct, Illinois had trouble paying its bills long before the current impasse began. The state’s fiscal collapse is the culmination of decades of budget gimmicks used to paper over Illinois’ structural spending problems and misplaced spending priorities that favor special interests over ordinary residents. State politicians have resorted to all sorts of schemes, from pension ramps to issuing pension obligation bonds to temporary tax hikes, to help “balance” the budget without reforming the underlying skyrocketing costs. These ploys have enabled politicians from both parties to preserve the status quo and to spend more on their misplaced priorities, such as high compensation and retirement benefits for government workers. The budgets under former Gov. Pat Quinn, for example, appeared balanced due to billions in borrowing, taxing and other budgetary maneuvers. Those maneuvers allowed lawmakers to avoid fixes to spending drivers such as pensions, government worker health care and local government subsidies. The credit rating agencies’ own downgrade history bears that out. 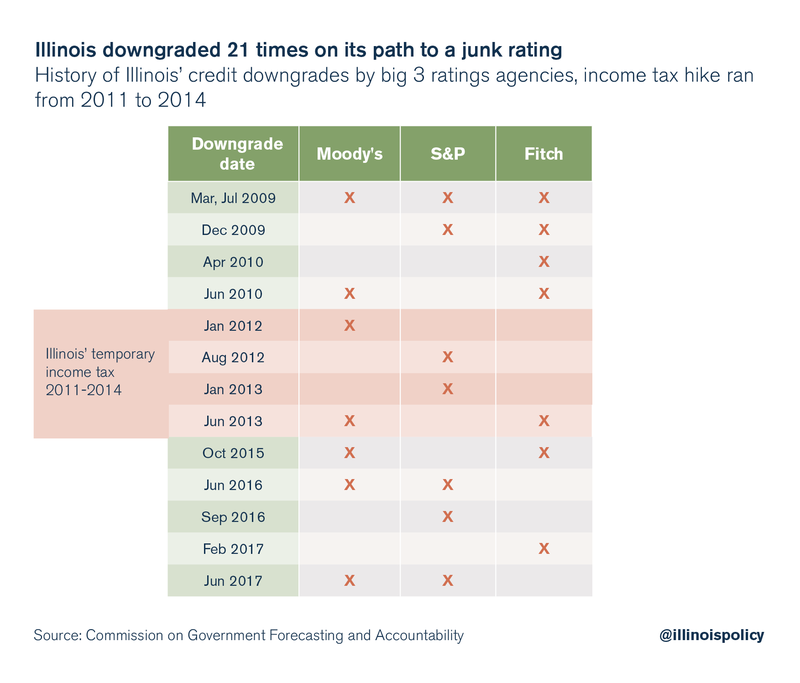 Illinois has suffered 21 downgrades from the three major ratings agencies since 2009. The downgrades began when Illinois started borrowing to conceal its growing pension crisis. As governor, Quinn borrowed a total of more than $7 billion in two years to make the state’s pension contributions. By 2010, Moody’s had already downgraded Illinois’ credit to the worst rating in the nation. The next five downgrades happened in the midst of the state’s record tax hike. The tax hikes that brought in $32 billion in new revenues failed to quell the rating agencies’ concerns about Illinois’ finances. And since then, in the absence of major economic reforms, eight more downgrades have followed. The latest round of dysfunction brings the state to just one notch above junk. The common theme in Illinois’ budget and ratings history is that the state has refused to pass real spending and economic reforms. In place of reform, politicians have used budgetary gimmicks, debt and more taxes to put off addressing Illinois’ mounting problems. Illinois can’t afford to put off structural reforms any longer. Illinoisans need comprehensive reforms that balance the budget without tax hikes. The state can’t leave real fixes for later – that will only mean a deepening fiscal crisis, higher taxes and more downgrades.